If you have a dog, you probably say this multiple times a week. You are at a bar, having drinks with friends, and at some point you see the time, and you start to gather your things. Your friends look at you with interrogating eyes. And you drop the bomb: ‘Sorry, guys. I need to get back home to let the dog out. Yes, once again, you feel like the party pooper, as if your reason to leave is not a good excuse, and your dedication to your dog is over the top, and you must be a crazy dog lady to leave a party for this four-legged friend who is waiting for you at home. Anyway, you leave, because you have this silent deal with your dog. He trusts that you will take care of his needs, and he will never let you down. As you are walking back home you think again about this friend who always makes you feel like a slave to your dog, and you feel miserable. When they have to leaving for their children, they are celebrated: ‘You are such a good parent!’ But, of course, a dog is not a child. A dog should be a toy that you get out of the closet when you need it, and nothing more. But what if you like to feel like someone is waiting for you at home? What if you have the craving to take care of an innocent living being, and your dog fulfills this need in a healthy way? Your dog forces you to go outside at least twice a day, rain or shine. Your dog forces you to walk in the neighborhood and sometimes go to the park nearby, and maybe stay at the dog park for an hour and meet other pet parents like youself. Those people come from different backgrounds, different social classes, different generations, but they all share the same passion: their furry friends. You talk with them about dogs: ‘What’s his name? How old is he? Where did you adopt him from?’ and so on. People at the dog park usually don’t know much about each other. Sometimes you don’t even know their names, let alone their professional titles. But you know the name of their dogs! When you talk to another pet parent at the dog park about another pet parent, you identify him as, ‘Molly’s dad, you know, the big Pyrenean Mountain Dog?’ and they know who you’re talking about. Dogs take us away from of our usual concern: human beings. And I think that’s one of their best qualities. In this modern world, where the search for happiness and personal achievement is a never-ending race, taking the time to take care for another living being is a blessing. Oh, you can surely have this same feeling with children, but at some point children will probably reward you with good school results that you can brag about, a successful career that will make you proud and confirm that you did a good job. Your dog will never give you that. Your dog will not take care of you in your retirement and will never give you a Christmas gift. But your dog changes your perspective of the world and teaches you everyday to be happy with little things. Your dog makes you smile when he is chasing a butterfly as if it was the only important thing in life. Your dog teaches you how to connect with other living beings without the need for words. He looks at you with trusting eyes and make you feel like you’re a part of something bigger than youself: nature. Your dog probably makes you a more compassionate person, and helps you live in the now―and that should be the goal we are all aiming for in life. And let’s face it, your dog probably gave you a good reason to leave another conversation about personal achievement and ego problems at work! Big ups to all the good pet parents out there! 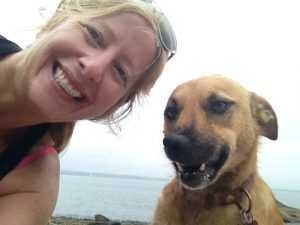 Marilou David has been an animal rescuer since a young age. Squirrels and alley cats in her neighborhood in Montréal, Canada, all got food from little Marilou, who exhausted her mother with the number of animals she wanted to adopt! As an adult, Marilou has pursued a career as a publicist, keeping enough liberty and time to travel a lot, which is important for her. 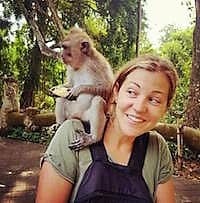 When she started to travel in the developing world she was shocked by all the animals she saw living on the streets. South America, North Africa, southern Asia, and some parts of Europe: each trip gave a new face to animal suffering. This was all it took to make Marilou want to help animals all around the world. 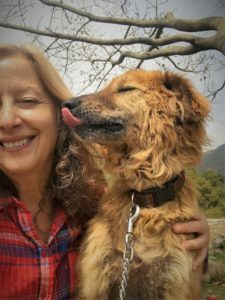 First she adopted a cat from Europe, then an old dog from Chile, then a small puppy from India. 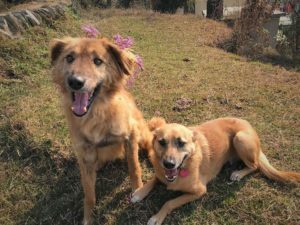 Marilou is now managing a small animal rescue in her hometown called Stand by Me, which helps Canadian people to adopt street dogs from developing countries.